It’s Creature of the Month time! 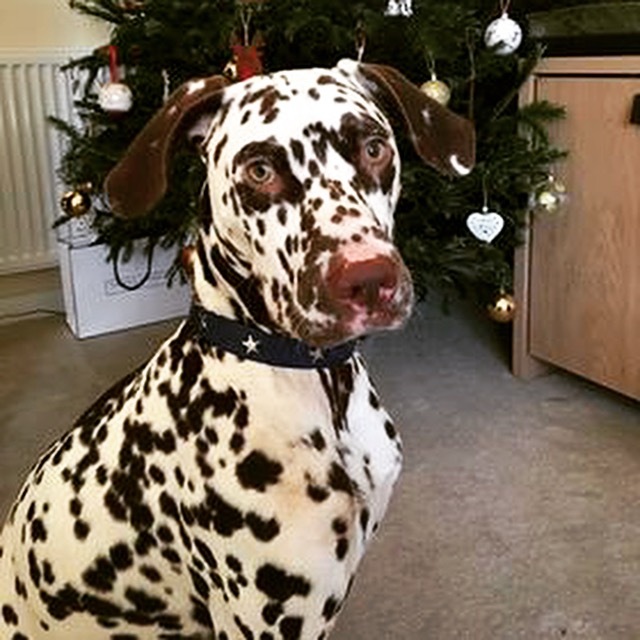 Yes… it is the time when we gather together all of the gorgeous photos that we have been sent by our customers over the past 4 weeks and put them all on instagram for you guys to see and vote for your favourites. The photo with the most “likes” wins a 50% discount voucher to use on our website and is featured in our newsletter. 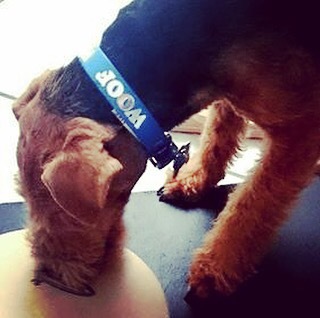 Voting closes and likes are counted at 6pm on Thursday 31 January, so get voting! Here are this months Creature Contestants… we love you guys! 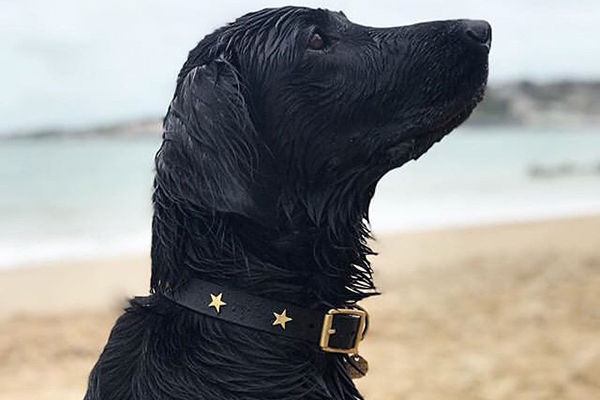 Gretel wearing our classic black leather with brass stars collar, looking beautiful after a swim at the beach. 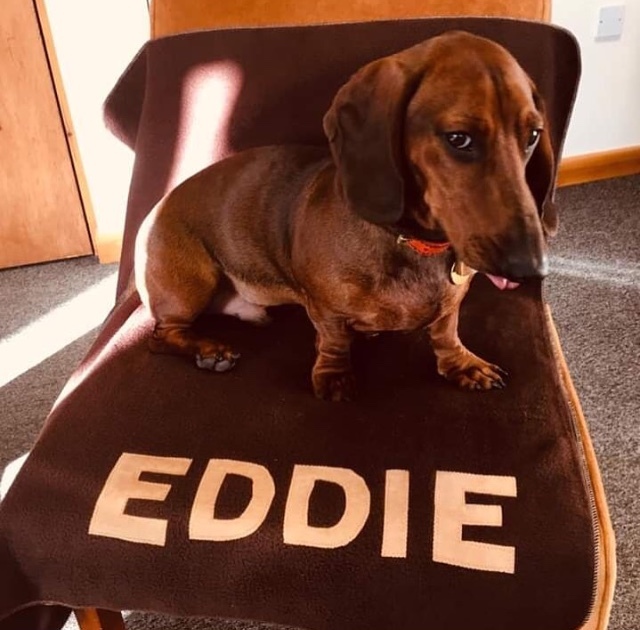 Eddie Little Legs looking rather regal on his bespoke blanket – a very special order for a very special little dog with especially muddy little feet. Gustavito having a snooze on his “vintage” dog bed cover – these cunning beds are great as the come as just the cover, which perfectly fits a single duvet folded in 4. 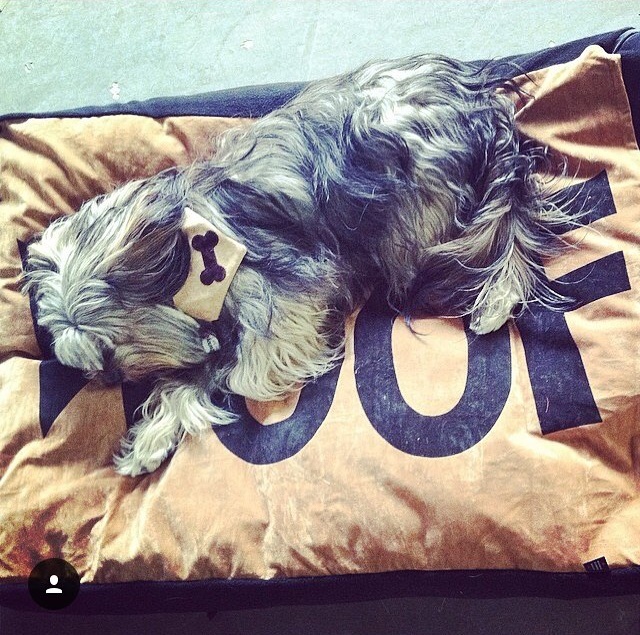 Gus is going for the double as he is also rocking one of our matching slip on bandanas – super stylish. 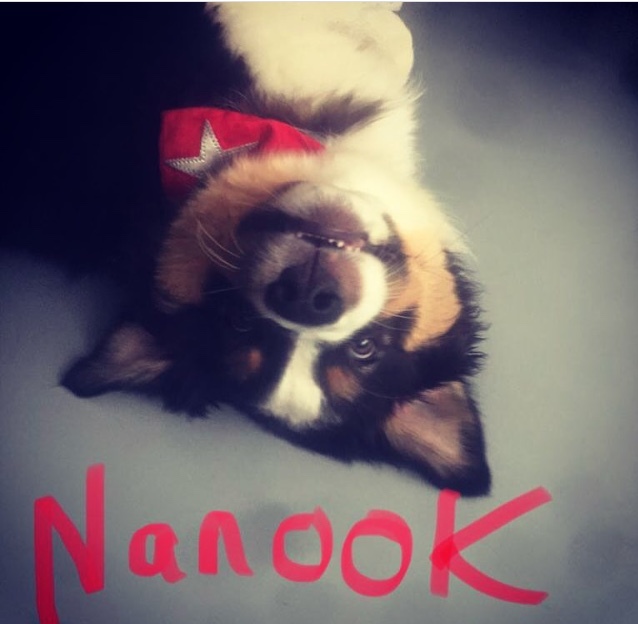 This is Nanook, the Aussie Shepherd Pup, who can’t sit still (who would want to anyway?) and is utterly gorgeous. Oooh we love him. 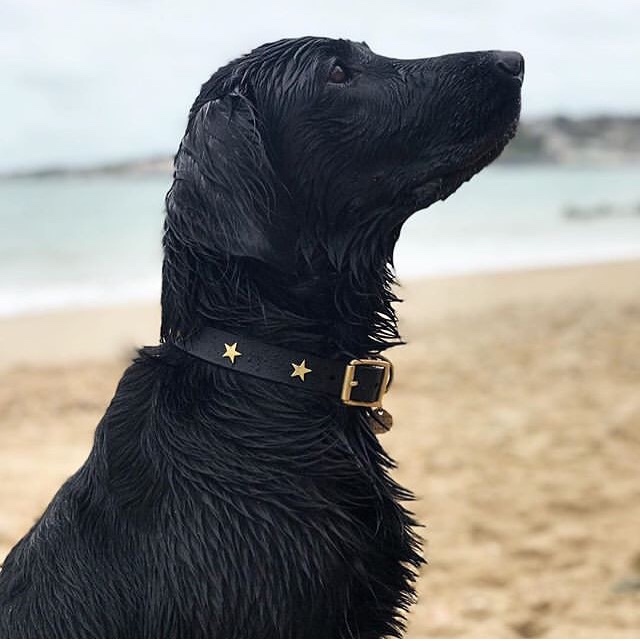 he is rocking his Bowie Star Slip on Bandana, and somewhere under all that fur is our classic black leather dog collar with brass hearts. 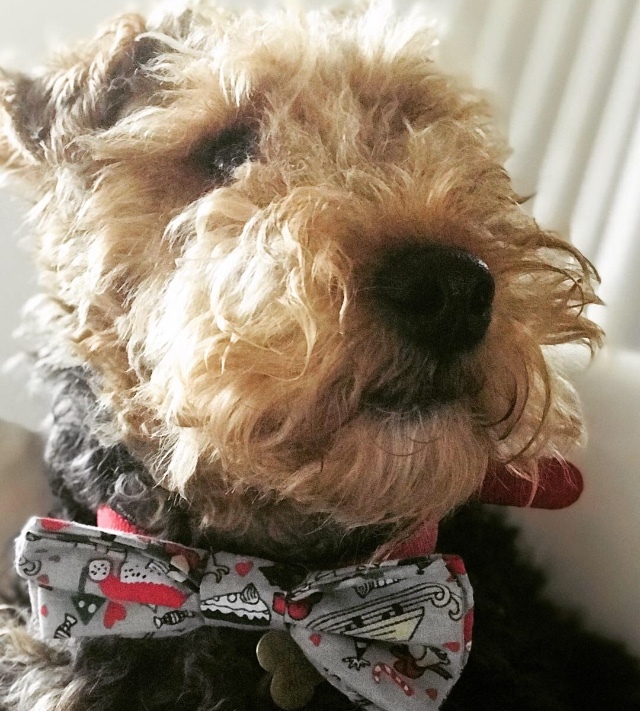 What a stylish and sweet hound. 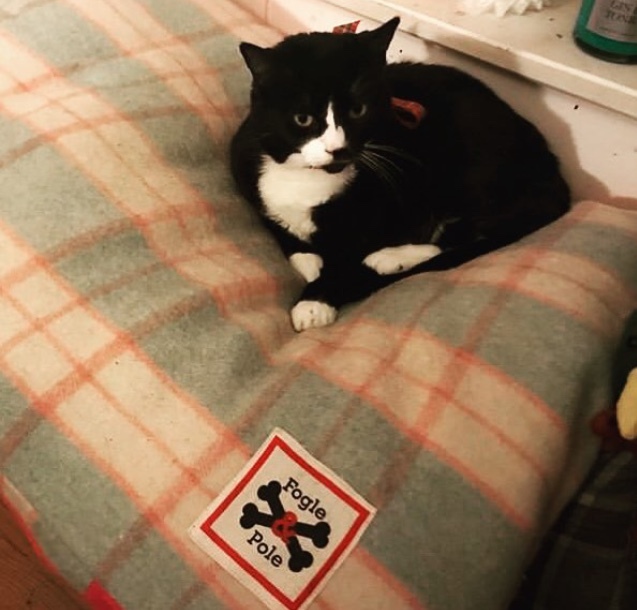 And now meet Penguin, aka Penny who got a beautiful Fogle & Pole Vintage Welsh Blanket bed for Christmas, and didn’t move from it until New Year. A lot of cats prefer a bigger bed, which is why we make out Cat Nappas in both small and medium. 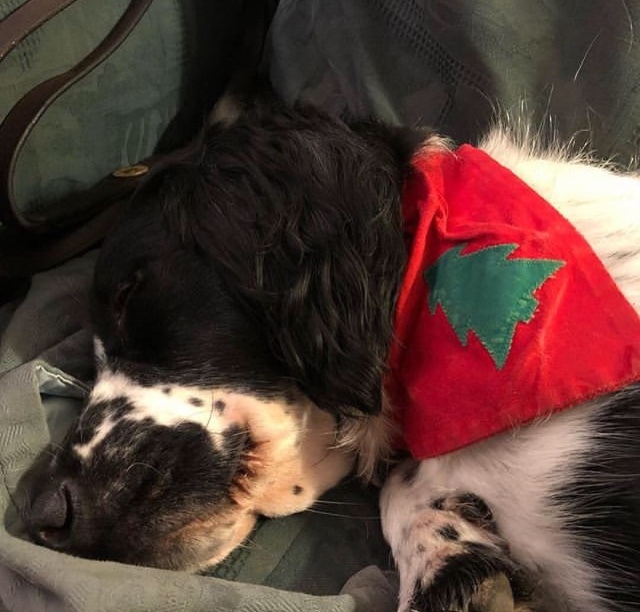 Neo having a snooze after a very busy Christmas in a much loved and worn Classic Christmas Tree Bandana. 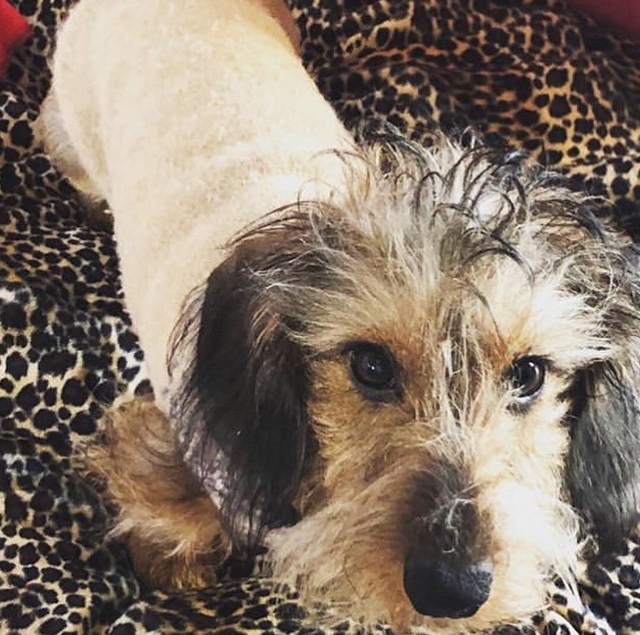 This is Rodney looking utterly adorable on his new Leopard & Red fleece Padded Blanket – what a sweetie! 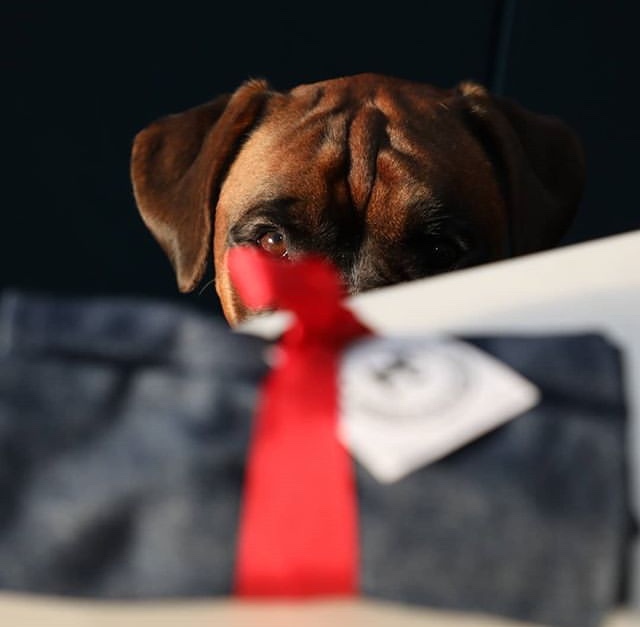 This is Hunter, a beautiful young Boxer, who received one of our new Roll of Bones for Christmas. How good is he??? 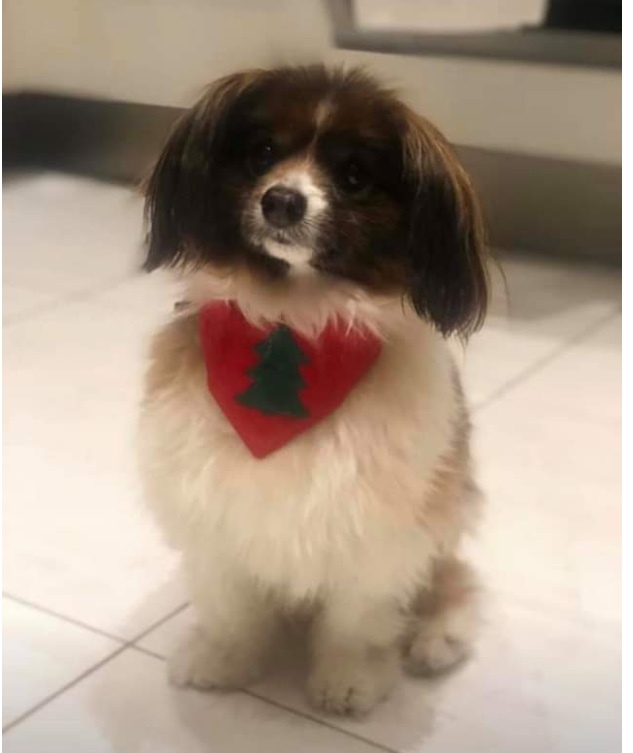 He is surely going to get a treat for such good sitting and waiting! This is Donald. We love you Donald and wish we were as poised and elegant as you! Donald is wearing a Royal Stewart Slip on Bandana (very similar to the ones that we make for the Buckingham Palace shops). Gorgeous. 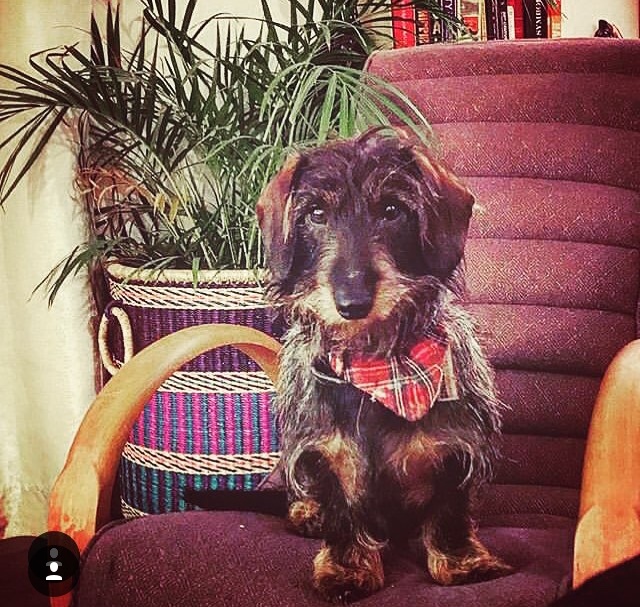 And here is Stanley, looking very dapper indeed in his Santa Print Bow Tie. What a very elegant man he is. This entry was posted in news and tagged Australian Shepherd, Bespoke Pet Products, Blankets, Bonios, Boxer, Cat Beds, Christmas Bandana, Creature of the Month, Dashunds, Designer Pet Products, Dog Bandanas, Dog Bed Cover, Dog Blankets, Dog Bow Ties, Dog Collars, Fogle and Pole, Handmade in the UK, Handmade Leather Dog Collars, Leather Dog Collars, Leopard Print, Long Haired Retriever, Roll of Bones, Slip on Bandanas, Springer Spaniel, Star Studded Dog Collars, Stars, Tartan, Welsh Blanket Pet Beds, Wirehaired Daxie.